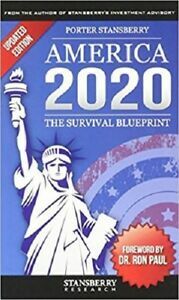 America 2020: The Survival Blueprint by Porter Stansberry 2015 Hardcover 2nd Ed. 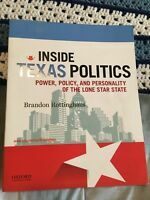 Hard copy: The United States is destroying itself from the inside out.The Corruption of America is a kind of moral decay... a kind of greed...a kind of desperate grasp for power. And it's destroying our nation.These corruptions do not need to exist.If individual Americans take it upon themselves to become bettercitizens, act with rational self-interest, and reject the "ethos of gettingyours"... we can correct these corruptions.That's why Stansberry Research founder Porter Stansberry publishedAmerica 2020: The Survival Blueprint. Many are referring to it as themost valuable book in America..."I love the book; it is so clear and concise. Though I have studied a bitabout the smartest way to survive what is coming, this put all the bestideas together in one place! My hat is off to you guys! - J.R."Absolutely excellent book!! I need to buy another 12 for my familyand friends." - K.B. "I read it the first day I had it. It is a great book that explains ourcurrent situation simply and very accurately. I intend to continue to usethis book as a guide for investing and I will recommend it to my familyand friends." - L.R. "This is a story all Americans should know about. I don't usually buythings off the Internet, but I am extremely glad that I made an exception inthis case." - C.R. I guess if you believe investors are job creators which is one of the premises this book starts with it is not a bad book. Personally, I see consumers as the job creators which creates skepticism in my acceptance.